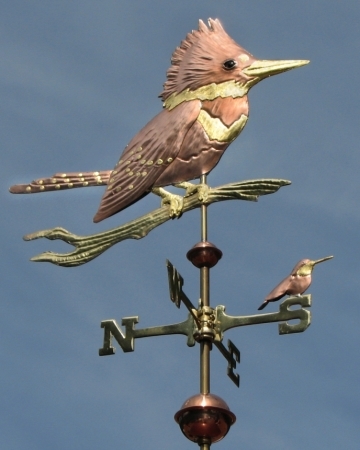 The copper Kingfisher weather vane featured in this photo has custom made glass eyes giving it a very life like appearance! The Kingfisher is noted for its striking contrast between it’s light and dark plumage. For that reason, the gold leafed sections mimicing the distinct white coloration are included. (Prices may change slightly based on the price of gold at the time of your order.) As the exposed copper sections darken, the contrast with the gold becomes more pronounced. The effect is quite stunning. 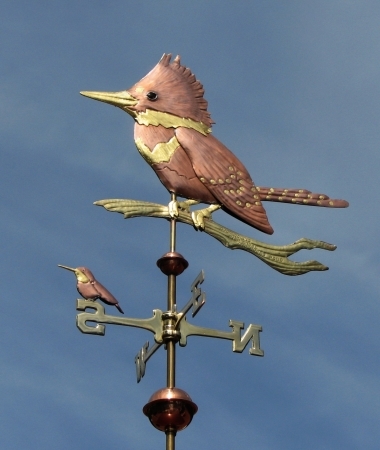 A customer who saw the actual hummingbird on the west directional in the in situ photo above asked us to craft one onto their vane. 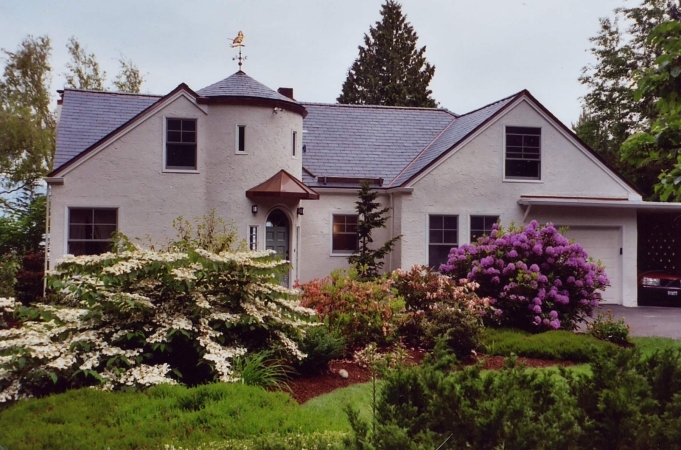 Please call us for pricing if this addition is of interest to you. This design is one of my personal favorites. 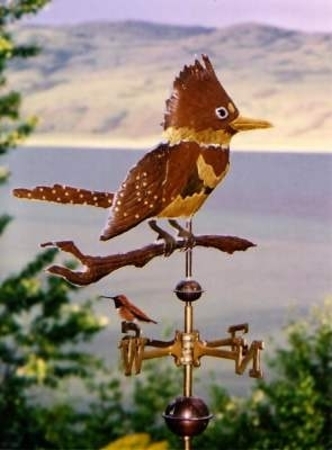 And it is one of our most popular bird weatervanes. 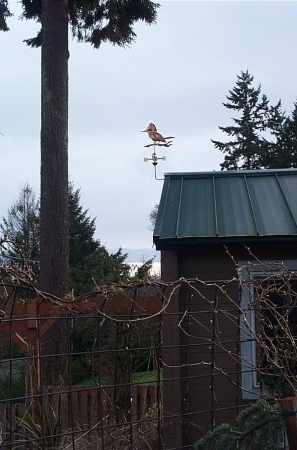 One is mounted on a fencepost in Washington state. Those customers have a nesting pair in a nearby tree. 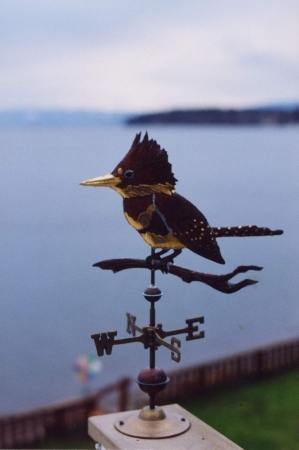 Another is mounted on a rooftop in British Columbia, in the kingfisher’s Northernmost Range. 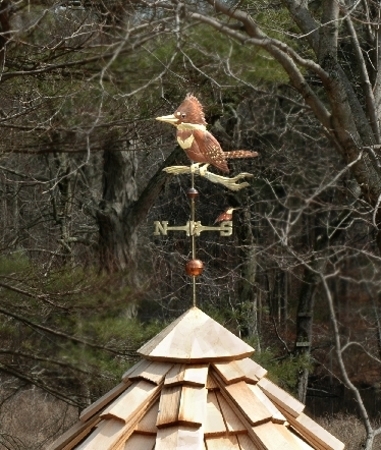 Gazebos are popular locations for all weather vanes, and one of our customers has theirs on a gazebo overlooking a pond. A perfect kingfisher locale! 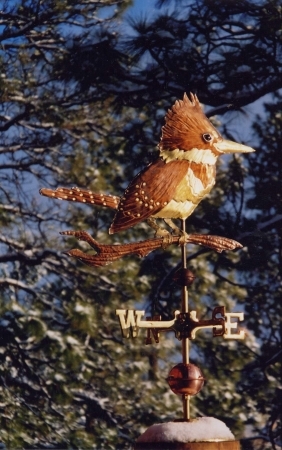 The Kingfishers are birds of the three families Alcedinidae (river kingfishers), Halcyonidae (tree kingfishers), and Cerylidae (water kingfishers). There are about 90 species of kingfisher. All have large heads, long, sharp, pointed bills, short legs, and stubby tails. They are found throughout the world. 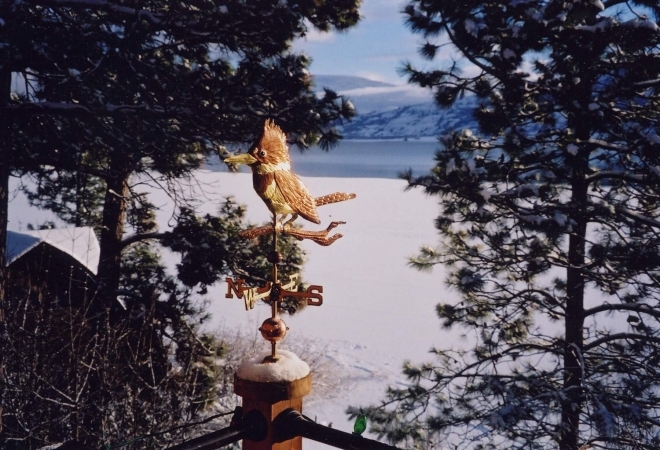 Copper is an excellent choice for cold climate lakeside or river settings, as it contains no ferrous metal and won’t rust. 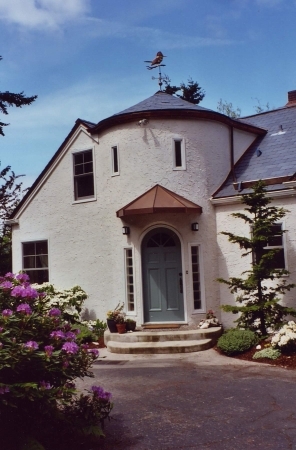 Copper is also extremely durable. 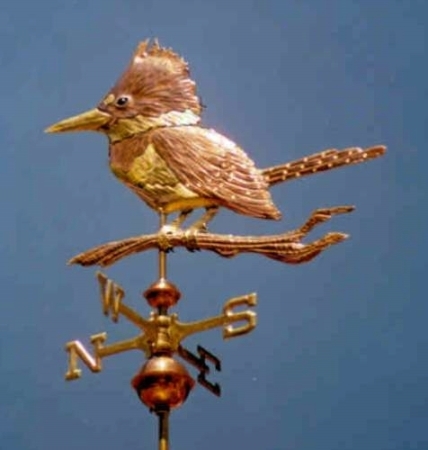 There are a surprising number of antique copper weathervanes on the east coast that have made it though more than 100 harsh New England winters and are still up on their perches working away!